The Student Engagement Office has administrative responsibility for student government, student activities, student leadership programs and extra & co-curricular programming. With an overarching commitment to student centeredness, we value collaboration, diversity, inclusivity, experiential learning, service, leadership and civic engagement. The office serves as a primary source of information and advice about extra & co-curricular opportunities and resources. We assist students in becoming involved in campus life, conduct leadership development programs, provide support to student organizations and their leaders, manage organizational finances, educate students about college policies, advise event planners and help students put classroom learning into practice through experiential education. 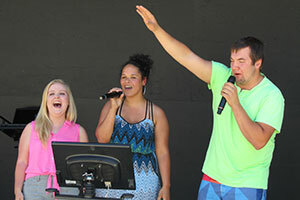 The cultural, educational, social and recreational programs developed through the Student Engagement office seek to provide a range of out-of-classroom experiences which are designed to compliment and supplement students' classroom experience and contribute significantly to their personal development. We work in partnership with students, faculty and staff to foster and support student opportunities for learning, involvement, leadership, and community building. 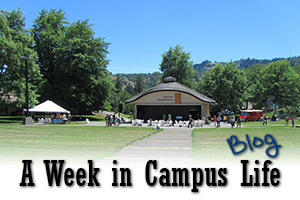 Left: Get the latest about what is happening for students by checking out "A Week in Campus Life" blog. These experiences serve as vehicles through which students explore their leadership capabilities by assuming campus leadership and governance responsibilities, develop positive interpersonal relationships and skills within groups, explore different ideas and experiences, optimize opportunities to learn through experience, make lasting connections, and develop a sense of civic responsibility and engage in campus and community life.